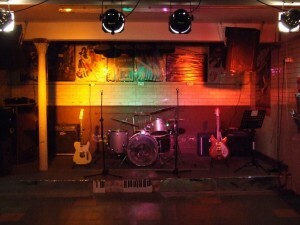 The Dock and Roll is Liverpool’s newest rehearsal room and live music venue. Situated on the outskirts of the city centre, with excellent transport links. On-street parking is available at all times and it is a 5 minute walk from Bankhall Railway Station. Fed up of rehearsing in soul-less rooms, looking at blank uninspiring walls! Had enough of hauling your drum kit and bass amp around, just for a rehearsal! The Dock and Roll is a truly unique experience. Designed by a fellow musician & a true music fan, it will have something of interest for everyone. Original Art and Music Memorabilia adorn the walls. With an 18ft x 10ft Stage, Full Light Rig, PA, Amplifiers, Complete Drum Kit and Mic Stands. The room is ready for you to arrive with guitars and mic’s in hand.